The general appearance for a door access system intended for use in Apple-controlled facilities has been revealed in a filing with the U.S. Federal Communications Commission, with the custom badge reader shown to have striking and sleek design befitting the Apple Park corporate campus. The latest FCC filing update reveals the device to have a large square glass panel on the front, measuring approximately 4.5 inches square and with rounded corners, with a white ring highlighted in the middle of the grey surface used as an indicator light. 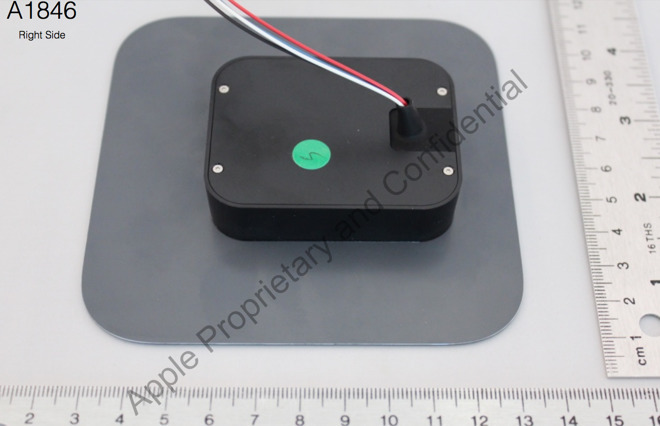 On the back of the glass plate is a smaller housing, with a set of four wires feeding out of a small hole, allowing it to be hooked up to a building's door entry and security systems. According to a manual found by Business Insider, the reader "will indicate granted access by briefly changing color to green and playing a sound." Attempts using unauthorized credentials will instead illuminate the ring with red light, with the reader playing a second sound to notify of failed access. The reader has the model number A1846, which is similar to another Apple-submitted wireless device submitted to the FCC previously. The "A1844" was revealed in March to be a door access system, using a similar color and sound indication system, though unlike the glass plate of the A1846 model, photographs showed this earlier model to be part of a larger door assembly, suggesting Apple has created multiple versions of the system to be used for different doorways. The earlier A1844 unit supports both NFC and Bluetooth Low Energy communication. While it is said the A1846 model supports NFC, the report does not mention if it will also include Bluetooth LE support, though this is likely. A third model, the A1845, has yet to be revealed in photographs, but probably shares the same functionality as the other two models. It is highly probable the door access hardware will be employed in the buildings within Apple Park, the company's latest Cupertino-based corporate campus. A high level of attention to detail has been used for the construction project, and while Apple could have acquired door access systems already available on the market, the executives instead chose to create their own hardware that matches the design aesthetic of the campus, as well as of Apple's own products. 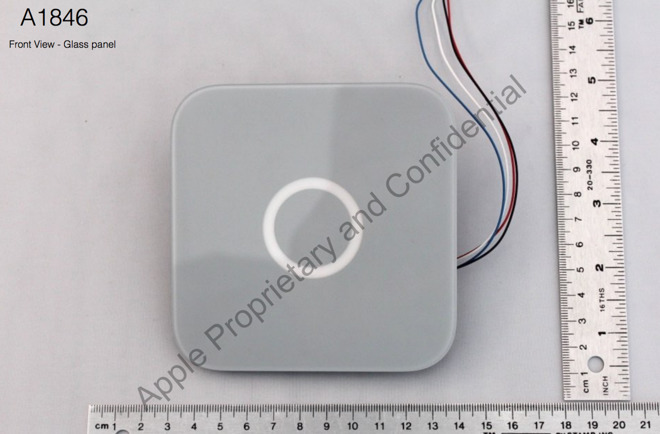 Initial reporting for the devices suggested there to be some sort of connection to the fourth-generation Apple TV, with diagrams used in filings seeming to use similar screw placement and case design elements to Apple's set-top box. While uncertain, these reports did indicate the hardware was not likely to be an Apple TV-like device due to differing power requirements.